The followin is a leet o the maist populous incorporatit places o the Unitit States o Americae. 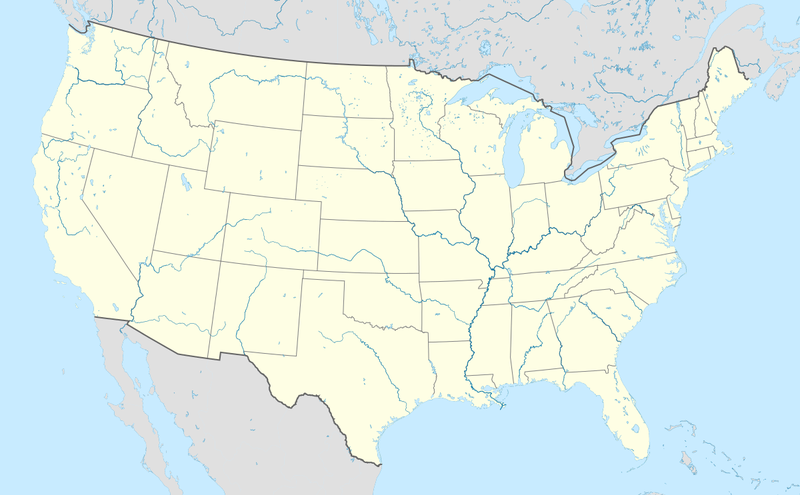 As defined bi the Unitit States Census Bureau, an "incorporatit place" includes a variety o designations, includin ceety, toun, veelage, borough, an municipality. A few exceptional Census Designatit Places (CDPs) are an aa included in the Census Bureau's leetin o incorporatit places. 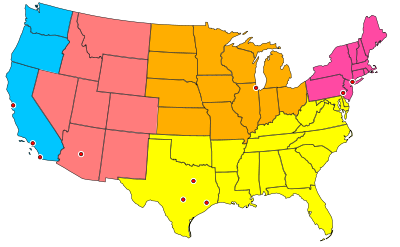 Consolidated ceety-coonties represent a distinct teep o govrenment that includes the entire population o a coonty, or coonty equivalent. Some consolidatit ceety-coonties, houiver, include multiple incorporatit places. This leet presents anly that portion (or "balance") o sic consolidated ceety-coonties that are nae a pairt o anether incorporatit place. Note that this leet refers anly tae the population o indiveedual municipalities within thair defined leemits, which daes nae include ether municipalities or unincorporatit suburban auries within urban agglomerations. A different rankin is evident when considerin U.S. metropolitan aurie populations. The followin table leets the 285 incorporatit places in the Unitit States wi a population o at least 100,000 on Julie 1, 2011, as estimatit bi the Unitit States Census Bureau. A ceety is displayed in bold if it is a state or federal caipital, an in italics if it is the lairgest ceety in the state. Five states, Delaware, Maine, Vermont, West Virginie, an Wyoming, hae no ceeties wi a population o 100,000 or mair. For ceeties wi populations o 100,000 or mair, the follaein distributions haud. Smawer incorporated places are nae included. The follaein table lists the five municipalities (municipios) o Puerto Rico wi a population greater than 100,000 on Julie 1, 2015, as estimatit bi the United States Census Bureau. The followin table leets U.S. census-designatit places (CDPs) wi populations o at least 100,000 accordin tae the 2010 Census. A CDP is a concentration o population identified bi the Unitit States Census Bureau for statistical purposes. CDPs are delineated for each decennial census as the statistical counterparts o incorporatit places sic as ceeties, touns an veelages. CDPs are populatit auries that lack separate municipal govrenment, but which otherwise physically resemble incorporatit places. Unlik the incorporatit ceeties in the main leet, the US Census Bureau daes nae release annual population estimates for CDPs. The followin table lists U.S. ceeties that, in past censuses, hae haed populations o at least 100,000 but hae syne decreased beneath this threshold or hae been consolidatit wi or annexed intae a neighborin ceety. The numeric decline in population frae its peak Census count tae the maist recent Census estimate in 2015. The percent decline in population frae its peak Census count tae the maist recent Census estimate in 2015. Ony additional notes o significant importance. ↑ Towns in New England, while incorporated on a level similar to cities in other states, are considered minor civil divisions by the Census Bureau an are not included in its list o incorporated places. A detailed discussion on this subject can be found at New England town#Census treatment o the New England town system. ↑ 2.0 2.1 The State o Hawaiʻi haes no incorporatit municipalities ether than the Ceety an Coonty o Honolulu, which comprises the entire Island o Oʻahu. In accordance wi Hawaiian law, the Unitit States Census Bureau defines the state's "ceeties" an "touns" as Census Designatit Places (CDPs). The Census Bureau defines the Urban Honolulu CDP as the portion o the Ceety an Coonty o Honolulu that is coextensive wi the Judicial Destrict o Honolulu. The Urban Honolulu CDP is what is generally thoucht o as the "ceety" o Honolulu, an its population is uised here an in other population comparisons. The Urban Honolulu CDP is currently the maist populous Census Designatit Place in the Unitit States. The Honolulu, HI Metropolitan Statistical Aurie comprises the entire Ceety an Coonty o Honolulu. ↑ 3.0 3.1 3.2 3.3 3.4 3.5 "Table 1. Annual Estimates o the Resident Population for Incorporated Places Over 50,000, Ranked by July 1, 2011 Population: April 1, 2010 to July 1, 2011" (CSV). 2011 Population Estimates. United States Census Bureau, Population Division. June 2012. Retrieved August 1, 2012. ↑ 4.0 4.1 4.2 4.3 4.4 4.5 "2010 United States Census Gazetteer for Places: January 1, 2010" (text). 2010 United States Census. United States Census Bureau. April 2010. Retrieved August 1, 2012. ↑ Or Federal Destrict in the case o Washington, D.C.
↑ City wins census appeal; count adjusted – Houston Chronicle. Chron.com (December 3, 2012). Retrieved on July 12, 2013. 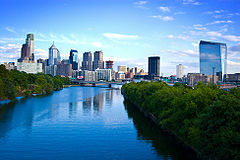 ↑ The City o Philadelphia an Philadelphia County, are separate but coterminous entities with a single consolidated ceety–county government. ↑ The City o Jacksonville, Florida, an Duval County, Florida, are separate entities with a single consolidated ceety–county government. The City o Jacksonville comprises all o Duval County except the other incorporated municipalities within the county. 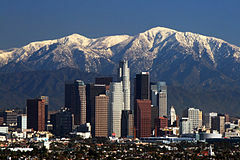 ↑ The City an County o San Francisco, Californie has a consolidated ceety an county government. ↑ The City o Indianapolis, Indiana, an Marion County, Indiana, are separate entities with a single consolidated ceety–county government. The City o Indianapolis comprises all o Marion County except the other incorporated municipalities within the county. See Indianapolis (balance). 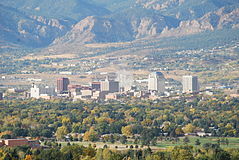 ↑ The City an County o Denver, Colorado, has a consolidated ceety an county government. 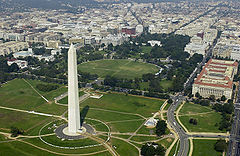 ↑ The City o Washington wis consolidated wi the Destrict o Columbie in 1871. 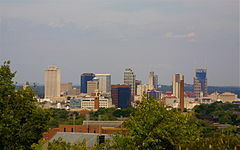 ↑ Nashville is a consolidated ceety-county. The population given is for the entire ceety-county, excluding other incorporated places lying within the ceety-county limits. (See Nashville-Davidson (balance), Tennessee). 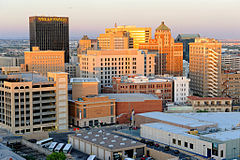 As o 2010, the population o the ceety-county including other incorporated places was 626,681. ↑ 15.0 15.1 15.2 15.3 15.4 15.5 15.6 15.7 15.8 This is an independent ceety that is not part o any county. ↑ The City o Louisville, Kentucky, an Jefferson County, Kentucky, are separate entities with a single consolidated ceety–county government. 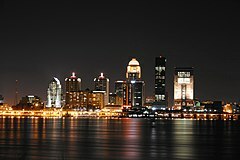 The City o Louisville comprises all o Jefferson County except the other incorporated municipalities within the county. See Louisville/Jefferson County metro government (balance), Kentucky. ↑ The City o New Orleans, Louisiana, an Orleans Parish, Louisiana, are separate but coterminous entities with a single consolidated ceety–parish government. ↑ The City o Lexington, Kentucky, an Fayette County, Kentucky, are separate but coterminous entities with a single consolidated ceety–county government. 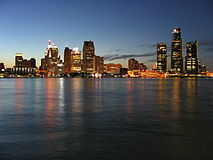 ↑ The Municipality o Anchorage, Alaska, is a unifee'd hame rule municipality that functions as baith a ceety an a burgh. 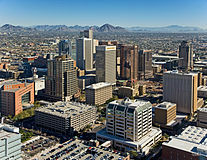 ↑ The Town o Gilbert, Arizona, is currently the most populous incorporated town in the United States. 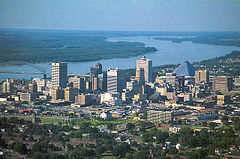 ↑ The City o Baton Rouge, Louisiana, an East Baton Rouge Parish, Louisiana, are separate entities with a single consolidated ceety–parish government. The City o Baton Rouge has retained its own ceety limits within East Baton Rouge Parish. ↑ The City o Columbus, Georgie, an Muscogee County, Georgie, are separate but coterminous entities with a single consolidated ceety–county government. ↑ The City o Augusta, Georgie, an Richmond County, Georgie, are separate entities with a single consolidated ceety–county government. The City o Augusta comprises all o Richmond County except the two other incorporated municipalities within the county. 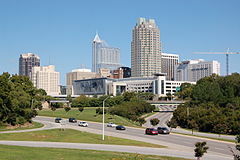 ↑ The Town o Cary, North Carolina, is currently the second most populous incorporated town in the United States. ↑ After approval by local voters in a 2012 referendum, the City o Macon, Georgie merged with most o unincorporated Bibb County, Georgie on January 1, 2014. The new consolidated government is officially "Macon-Bibb County." 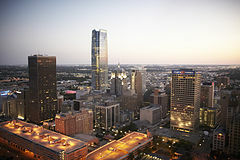 ↑ Kansas City, Kansas, an Wyandotte County, Kansas, are separate entities with a single consolidated ceety–county government. 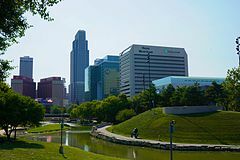 Kansas City comprises all o Wyandotte County except the other incorporated municipalities within the county. ↑ The City o Lafayette, Louisiana, an Lafayette Parish, Louisiana, are separate entities with a single consolidated ceety–parish government. The City o Lafayette comprises all o Lafayette Parish except the other incorporated municipalities within the parish. ↑ The City o Athens, Georgie, an Clarke County, Georgie, are separate entities with a single consolidated ceety–county government. The City o Athens comprises all o Clarke County except the other incorporated municipalities within the county. ↑ 31.0 31.1 In the state o New Jersey, townships are full-fledged municipalities on par with any town, ceety, borough, or village. "Annual Estimates o the Resident Population for Minor Civil Divisions, by County: April 1, 2010 to July 1, 2015". 2015 Census Population Estimates. U.S. Census Bureau, Population Division. May 2016. Retrieved May 21, 2016. 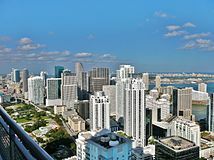 ↑ The Town o Davie, Florida, is currently the third most populous incorporated town in the United States. ↑ Jurupa Valley was incorporated as a ceety on July 1, 2011 from various portions o unincorporated territory in Riverside County, Californie. Because o this, there is no official 2010 Census population. ↑ "Census o Governments" (PDF). Government Organization. U.S. Census Bureau. December 2002. Retrieved December 30, 2010. ↑ 35.0 35.1 35.2 35.3 "Annual Estimates o the Resident Population: April 1, 2010 to July 1, 2015". 2015 Census Population Estimates. U.S. Census Bureau, Population Division. May 2016. Retrieved May 21, 2016. ↑ The population o all North Side neighborhoods o Pittsburgh (41,120), plus Census Tract 4270 Blocks 2 & 3, which are the sections o Millvale, Pennsylvanie that were formally part o Allegheny City. (an additional 2,301), which totals to 43,421. All data from the 2010 Census. 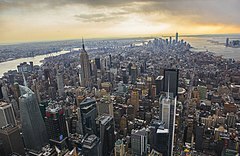 ↑ The population for Brooklyn in the 2010 Census was 2,504,700. However, since Brooklyn is now a borough o the City o New York an thus no longer its own separate ceety, for the purposes o this chart, its current population will be regarded as negligible. This page wis last eeditit on 21 Julie 2018, at 06:12.